AMGmarket.com News from Stuttgart/Press Release: M ercedes-Benz unveiled the face-lifted A-Class, new features such as DYNAMIC SELECT and the suspension with adaptive damping adjustment are now also available for the B-Class, CLA and GLA. At the same time the model range of these model series has also been extended. New on the scene are entry-level versions and output-enhanced top models. The new compact models can be ordered with immediate effect, and deliveries will start in September. The success of the compact car family from Mercedes-Benz continues to go from strength to strength: in June a total of 54,379 customers opted for a model in the A- and B-Class, the CLA, CLA Shooting Brake and GLA (+29.8%). In the first half of this year the brand with the star sold around a quarter more compact cars than in the first six months of the previous year (269,527 units, +25.2%). With similarly strong growth the CLA achieved a sales record (+25.5%). The CLA Shooting Brake enjoyed enormous popularity in the first months following its market launch. DYNAMIC SELECT is now available for all models in the compact car family. With this the vehicle characteristics can be adjusted in seconds at the touch of a button, as the system modifies the engine, transmission, suspension, steering and air conditioning at the driver’s behest. The four driving modes “Comfort”, “Sport”, “Eco” and “Individual” can be conveniently selected using the switch in the upper control panel. For the GLA there is the additional “Off-road” driving mode. DYNAMIC SELECT allows a particularly broad range of setting options in combination with the new suspension with adaptive damping adjustment (also available as an optional extra for all compact models). In this case the driver is able to modify the vehicle’s damping characteristics using the DYNAMIC SELECT Switch. 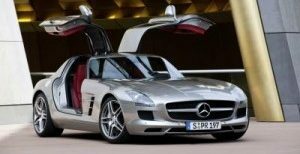 As part of the modification measures for the compact models, Mercedes-Benz is also launching the new nomenclature for the drive system in these model series. Whilst the petrol versions remain without a supplement, the lower-case letter “d” supersedes the abbreviation “CDI”. The Electric Drive model of the B-Class is now called B 250 e, the natural-gas variant B 200 c.
The dynamic top models of these model series are also available with a manual transmission on request, this applies to the B 250, CLA 250 (Coupé and Shooting Brake), CLA 250 Sport (Coupé) and GLA 250. 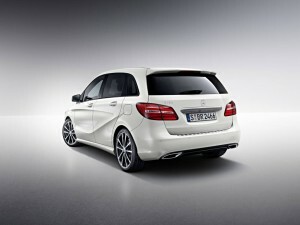 The new entry-level model in the B-Class range is the B 160 with 75 kW (102 hp). The new efficiency champion is the 80 kW (109 hp) A 180 d BlueEFFICIENCY Edition, which gets by on NEDC fuel consumption of just 3.6 l/100 km. The CO2 output is 94 g/km. From December 2015 the B-Class is available in the fresh trendy colour elbaite green metallic. No less than three new models enrich the CLA Shooting Brake range: also new alongside the diesel CLA 180 d with 80 kW (109 hp) are the two all-wheel drive versions CLA 200 d 4MATIC and CLA 220 d 4MATIC. The CLA 250 Sport and CLA 250 Sport 4MATIC sports models have now become somewhat more powerful as the Coupé and Shooting Brake with 160 kW (218 hp) instead of 155 kW (211 hp). The top diesel GLA 220 d model is somewhat more powerful than previously, with 130 kW(177 hp) (+5 kW/7 hp). Performance characteristics: 7.7 seconds from 0 to 100 km/h and a top speed of 223 km/h (data for cars with front-wheel drive). In future the GLA will boast the latest infotainment generation from Mercedes‑Benz. The free-standing display screen features a larger screen diagonal of 17.8 cm (7 inches), together with a high-gloss piano-black front panel and a flush-fitting frame in Silvershadow. In combination with COMAND Online, or as an option for the Audio 20 system, the display is available with an even larger screen diagonal of 20.3 cm (8 inches). The youngest COMAND Online generation (optional extra) includes the use of the Mercedes connect me services such as Traffic Information. “Mercedes connect me” links the GLA with the world around it. Mercedes connect me Standard Services can be used with the standard communications module. Available services include, for example, Accident Recovery, Maintenance Management and Breakdown Management. There is also news with regard to smartphone integration: from the beginning of 2016, Apple® CarPlay® and MirrorLink® will be available for all compact cars. In the case of Apple® CarPlay® for example, the system supports making phone calls, navigating and listening to music, receiving and sending SMS and emails as well as Siri voice control. Owners of MirrorLink®-compatible smartphones can mirror apps specially optimised for use while driving to their vehicle display for safe and convenient use. Like the B-Class the GLA is also available in the fresh trendy colour elbaite green metallicfrom December 2015.